A Lesson in History – Tell my story. This weekend, I’m working on a small part of the second chapter of Emmett’s story, taking place in December, 1899. Emmett is coming home from college (West Florida Seminary) for Christmas. I want to describe what the town looked like when he hopped off the L&N train at the Chipley depot (which was pretty much in the same place as the current Amtrak depot today). 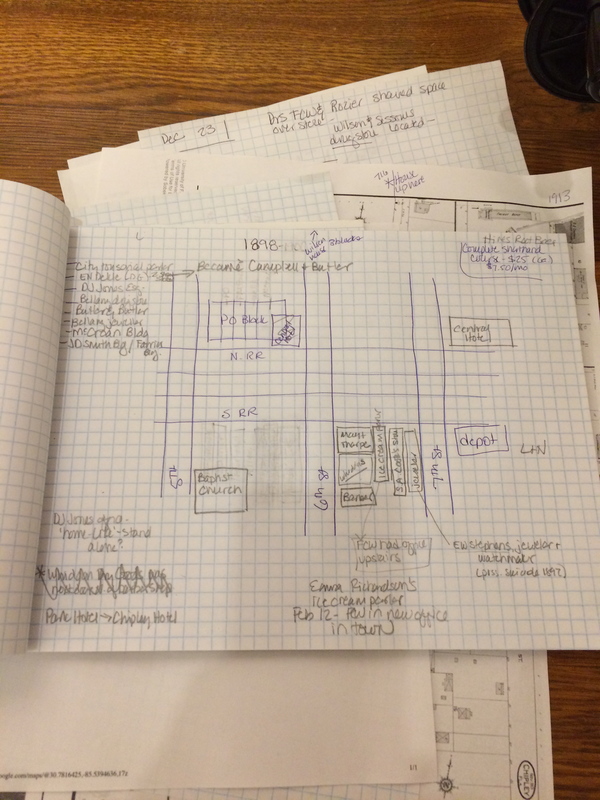 What businesses lined the streets of downtown Chipley as he walked home the five blocks from the corner of 7th and Railroad Streets to the family home on 6th Street? Where was his father’s office? I contacted my friends at the Washington County Historical Society (coincidentally located on the grounds of the old depot, a few hundred feet from the current Amtrak depot). The earliest map of Chipley they have is a Sanborn Fire Insurance map. So, how do I figure out what was there on the day Emmett got off the train, when there’s no official city map from that year? I cobble them together myself. A map of Chipley 2015 from Google Maps on the upper left, and a printout of the 1913 Sanborn map, for comparison. The rough maps are neither to scale, nor precise. I gleaned the information about what was where from reading all that microfilm of The Chipley Banner over the past two years. Ideally, I’d cross-check this information with tax records, but for my purposes, I only need a general idea of Dr. F.C. Wilson’s office location, and the distance it took to walk from Dr. Wilson’s office, to the depot, to the Wilson home. When I see my friends in Chipley week after next, I’ll show them what I’ve done, and have one or two of the historical society staff check it out for me. I’ve been in touch with a few of the local history buffs who I’ve consulted about this little side project, and they would like to create a map like this for the museum. The thing is, all of these folks are volunteers. The museum is open only one day a week (Fridays). Who has time to do this? My suggestion: This would be a great project for a senior high school class. 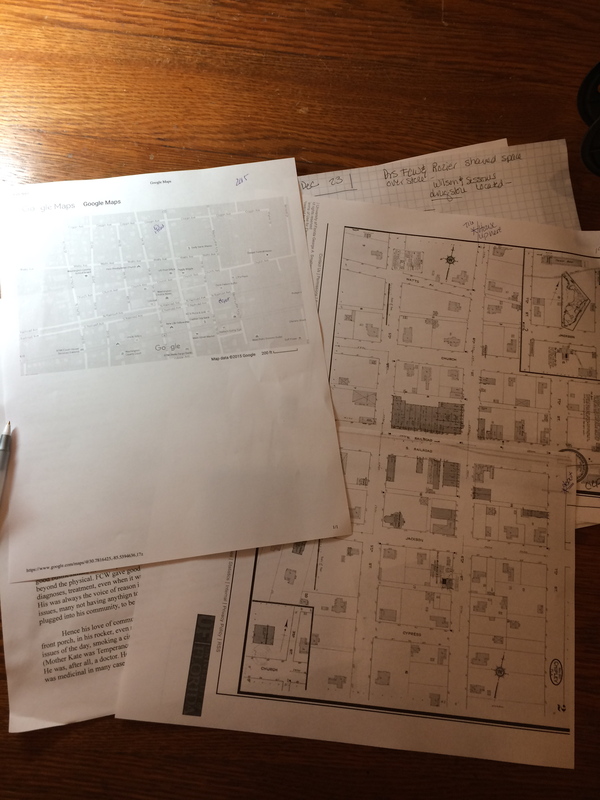 It could be a year-long or semester-long project, and would involve the students exploring original documents in the local archives (not just using Google), using mapping software to chart the businesses, creating a historical resource that folks like myself would love to consult! Not only that, I’ve learned that many of the families I read about in the 1899 editions of The Chipley Banner are still in Washington County, and in Chipley itself, so this project would appeal to some folks on a personal level. I think this is a great way to get young people involved in history, to learn how one actually conducts research, and to show them how their research efforts have immediate practical application. And…they’d get academic credit for it, with maybe a mention in the local media. Win-win!